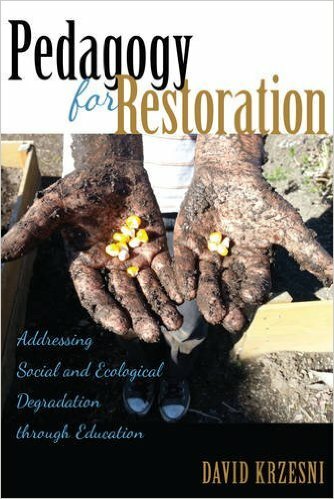 Abstract: Pedagogy for Restoration seeks to understand the conditions leading to the destruction of Earth in order to discover pedagogy for restoration. As we degrade the planet we degrade ourselves and as we degrade ourselves we degrade the planet. Moral development and socialization significantly influence our participation in, construction of, or resistance to the systems of oppression that degrade us. The process of restorative education recognizes that humans are fundamentally good and moral and seeks to promote healthy moral development. We must help students meet their basic needs, center their own identities and experience, and simultaneously emphasize community and relationships to help them find a sense of purpose. These efforts facilitate social and ecological restoration by allowing students to reach a physical and emotional place that is conducive to learning and self-efficacy so that they may engage with whatever issues they find important in their own way and on their own terms.